CIHI's vision is "to assist in the development of deliberately trained, competent, generalist physicians to meet the health needs of the community and country." International Health Care Opportunities in Family Medicine provides you with a collection of international opportunities that you can take advantage of now and as you advance through your career as a family physician. Founded in 1990 by a group of volunteer physicians including the late Dr. Jonathan Mann, Doctors of the World-USA is an international health and human rights organization working where health is diminished or endangered by violations of human rights and civil liberties. GHEC is a consortium of faculty and health care educators dedicated to global health education in North American health professions schools and residency programs. 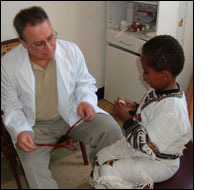 The International Medical Volunteers Association (IMVA) is a nonprofit organization that promotes, facilitates, and supports voluntary medical activity through education and information exchange. It provides information about volunteer opportunities and offers practical advice on how to find and choose compatible assignments. The International Healthcare Opportunities Clearinghouse (IHOC) web site is designed for health-care professionals and students who are interested in volunteer work with underserved communities at home or abroad. The IHOC website was begun in 1996 by a small group of faculty members and students from the University of Massachusetts Medical School, Worcester, Massachusetts. IHOC is an ongoing project maintained by the Lamar Soutter Medical Library, University of Massachusetts Medical School.